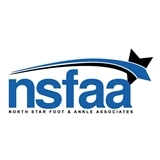 North Star Foot & Ankle Associates (Garland) - Book Appointment Online! North Star Foot and Ankle Associates, P.A. offers comprehensive medical and surgical treatment of conditions affecting the foot and ankle. We specialize in general foot concerns such as arch and heel pain, ingrown toenails, and athlete's foot, as well as diabetic foot care, and reconstructive foot and ankle surgery. We provide the highest quality of care for patients of all ages. Our philosophy begins by listening to your concerns, then applying a systematic approach to evaluate your podiatric needs, and reaching the best solution and treatment plan for you. Using state-of-the-art technology in both diagnosis and treatment, our care is uncompromised. Our knowledgeable and friendly staff wishes to make your office visit comfortable and informative, while our doctor is dedicated to getting you back on your feet and returning you to your normal lifestyle. We hope that you will call to schedule an appointment and come visit us firsthand!